Author: Cooper, Susan Set In . . . Description: In a tumbledown castle in the Western Highlands of Scotland lives the Boggart. He is invisible -- an ancient mischievous spirit, solitary and sly, born of a magic as old as the rocks and the waves. He has lived in Castle Keep for centuries, playing tricks on the owners. But the last Scottish owner has died and left the castle to his great-nephew Robert Volnik of Toronto, Canada. The Volnik family -- including Emily and her nine-year-old computer genius brother Jessup -- visit Castle Keep, and when they return to Toronto, they unwittingly take the Boggart with them. 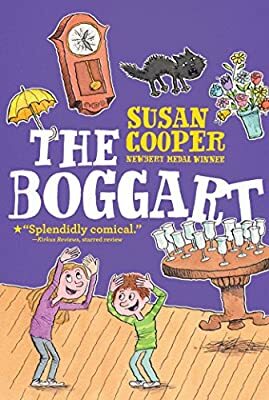 The astonishments, delight, and horrors that invade their lives with the arrival of the Boggart fill this swiftly moving story. The collision of modern techology and the Old Magic brings perils nobody could have imagined -- and, in the end, an amazing and touching solution to the problem of the Boggart who has found himself on the wrong side of the ocean. Sometimes extremely funny, sometimes wildly scary,and always totally absorbing, this remarkable story -- brilliantly imagined and beautifully written -- marks the return of the Newbery Award winner Susan Cooper to the field of novels for young readers. An outstanding achievement, The Boggart will work its special magic on all who read it.